Home AVFC Supporters Godvilla is Coming to the Holte End Next Season! Godvilla is Coming to the Holte End Next Season! New Manager, New Team, New Banner – Godvilla! Villa fans are already looking to get ready to liven up Villa Park from its graveyard silence of last season under Alex McLeish. Thanks to Villa Fans Deb Kelly and Nick Shale, they’ll be a 6ft x 4ft banner of Godvilla to be unleashed from the Holte End in the new season. The banner is something of a reboot of the ‘Godzvilla’ banner that once was at the 1977 league cup final replay between Aston Villa and Everton at Hillsborough. So there’s a nice traditional link there. All we need now is some kind of Godzuki version for the North Stand! If any Villa supporters have any ideas for banners or for creating an atmosphere, get in touch and we’ll try to help. UPDATE 2015: Wouldn’t it be an idea to create a bigger version of this banner? Comment if you have any views on it. Up from the depths, twenty-stories high…Godvilla! We may have Godzilla on the pitch. Barry Bannan fits the bill. 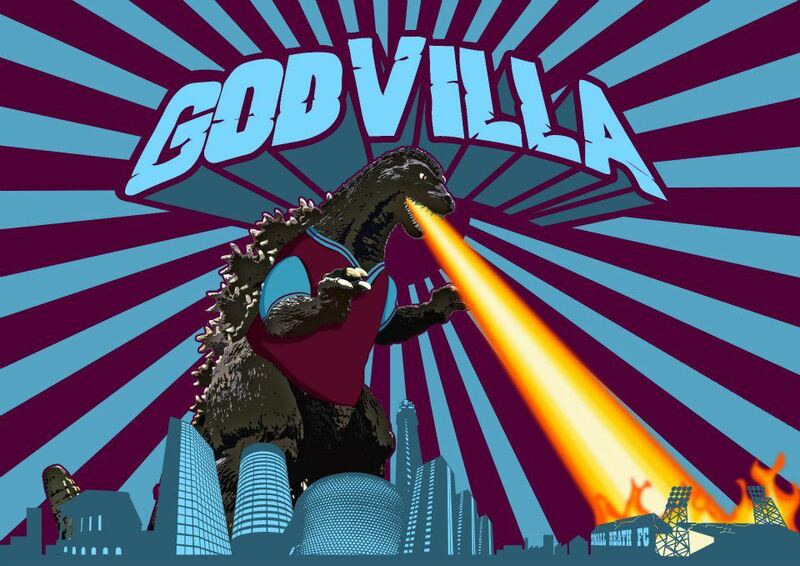 c) It’s a play on the name…Godzilla…Godvilla…you get me? e) It’s an alternative to Lambert’s Lions. What am i missing? A sense of humour perhaps? What is Godvilla meant to signify?